Professors Ben Blencowe and Leah Cowen with Serge Gueroussov and Mrs. Barbara Vivash (from left to right). To Serge Gueroussov, it all felt “surreal”. As many times before, he was in the usual lecture room, in which the newly awarded top graduate of the year was about to deliver a lecture about their PhD research. Only this time, it was Gueroussov who was on the podium. 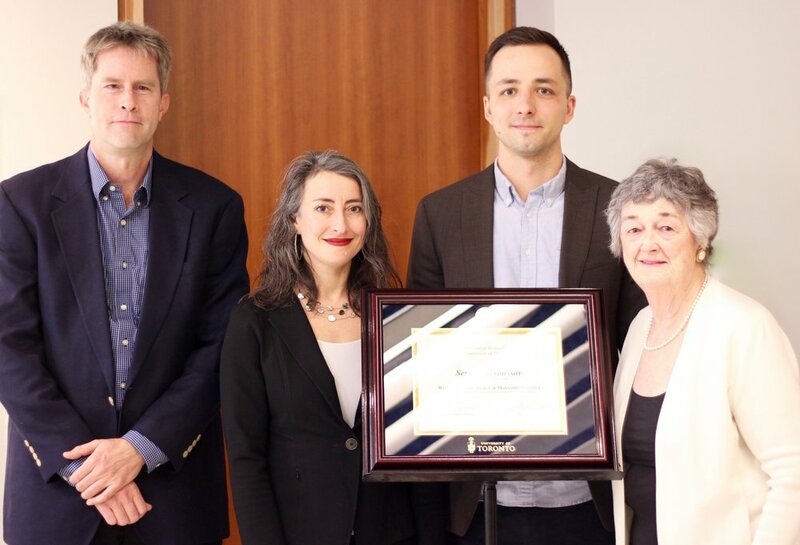 Gueroussov is the latest recipient of the Barbara Vivash Award in Molecular Genetics for the most outstanding PhD thesis in the University of Toronto’s Department of Molecular Genetics (MoGen). “During my time as a graduate student, some of the people that I looked up to the most went on to win this award, so to get it myself is very humbling,” says Gueroussov who came to the award ceremony from Cambridge, MA, where he moved to for postdoctoral training. Established in 2009, the Barbara Vivash Award in Molecular Genetics recognizes PhD research that has significantly advanced our understanding of how biological processes operate on a molecular level. Past awardees went on to have successful research careers at top universities, including University of California San Francisco, Princeton University and U of T.
The Barbara Vivash Award in Molecular Genetics was borne out of the family’s long-standing commitment to the field of genetic medicine, going back four decades to when Mrs. Barbara Vivash was involved with establishing the first clinics for genetic counselling in northern Ontario communities so their residents no longer had to travel far for expert advice. “We tremendously appreciate the support from the Vivash family with this gift, which provides important recognition of scientific excellence and promotes the success of the next generation of scientific leaders” said Professor Leah Cowen, Chair of Mogen. Gueroussov has already been successful at every stage of his career, publishing original research from when he worked as an undergraduate in Professor Alexander Palazzo’s lab at the Department of Biochemistry. But it was his PhD work in Professor Ben Blencowe’s group in the Donnelly Centre for Cellular and Biomolecular Research that revealed groundbreaking new insights about the evolution of cellular complexity. During this time, Gueroussov published seven papers including first author studies in top journals Cell and Science. “These were absolutely stunning, really original, landmarks studies,” said Cowen. The field of medical genetics has been transformed from its fledgling roots in the last century in part due to rapid advances in DNA sequencing and data analysis. Researchers today have an unprecedented view of how cells operate on a molecular level, revealing clues about what causes disease and how best to treat them. These advances are also shedding light on the age-old question of how we as humans evolved with our advanced tool making, language, problem solving and social skills. During his PhD, Gueroussov revealed one piece of this puzzle. Building up on previous work in the lab, he uncovered how a cellular process known as alternative splicing could have driven brain evolution in mammals. Alternative splicing enables cells to produce a far greater variety of proteins—the cell’s workhorses— than there are genes encoding them. Gueroussov found a molecular switch in this process that only works in the mammalian brain and which has contributed to tissue complexity and possibly also the evolution of advanced cognitive functions. In another study, Gueroussov revealed a tantalizing possibility that one of the roles for alternative splicing in the brain might be to ward off sticky proteins that form large aggregates and are a hallmark of neurodegenerative diseases such as Parkinson’s and Alzheimer’s. Since last September, Gueroussov has been living in Boston, where he is working as a postdoctoral fellow in the lab of Professor Feng Zhang, a celebrated researcher who was one of the first to use the gene editing tool CRISPR to edit genes in human cells, at the Broad Institute of MIT and Harvard. At the Broad, Gueroussov is investigating new strategies for editing not the genes, but the genes’ messages, or RNA molecules that act as protein templates. These new technologies open exciting possibilities as research tools to study RNA biology, he said.